Italian Prime Minister Paolo Gentiloni will pay a working visit to Russia on Wednesday and will hold a meeting with Russian President Vladimir Putin. MOSCOW (Sputnik) — The Soviet Union and Italy established diplomatic relations on February 7-11, 1924, and later signed the bilateral Friendship, Non-Aggression and Neutrality Treaty in 1933 to cement these ties. However, when Rome joined Germany in its war against the Soviet Union on June 22, 1941, the diplomatic relations between the USSR and Italy were terminated. This break was only temporary, as the fall of Benito Mussolini’s regime in Italy once again brought about a diplomatic relationship between the two countries. In 1991, Italy recognized Russia as the Soviet Union’s legal successor. The core principles of the countries' bilateral relations are reflected in two documents: the Treaty of Friendship and Cooperation between the Russian Federation and the Italian Republic on October 14, 1994; and the Action Plan of Relations between Russian Federation and the Italian Republic of February 10, 1998. In addition, both sides have accumulated numerous inter-governmental and inter-departmental agreements in specific areas of bilateral cooperation over recent decades. Italy ranks among the Russia’s most important European partners. Both countries work to maintain and expand cooperation and conduct a detailed political dialogue in international organizations and forums. Between 2002 and 2013, Russia and Italy regularly held expanded interstate consultations during bilateral summits. The consultations were chaired by the Russian president and Italian prime minister and also involved key governmental ministers. Eight meetings in this format were held during that period, including the latest which took place in Trieste on November 26, 2013, during Putin’s working visit to Italy. During that same visit on November 25, 2013, he also met with then Italian President Giorgio Napolitano. In 2013, Putin and then Prime Minister Enrico Letta also met on June 17 and September 5 on the sidelines of the G8 summit in Lough Erne, Northern Ireland, and the G20 summit in St. Petersburg. The following year on February 7, Letta attended the opening ceremony of the 22nd Olympic Winter Games in Sochi. Putin met with Letta's successor Matteo Renzi on the sidelines of the 10th Europe-Asia Forum in Milan and the G20 summit in Brisbane, Australia on October 17 and November 15, 2014. Just one day prior the Milan event, Putin and Napolitano met for the second time. On March 5, 2015, Putin and Russian Prime Minister Dmitry Medvedev met with Renzi in Moscow during the latter’s working visit to Russia on March 4-5, 2015. Putin and Renzi discussed the prospects for expanding bilateral trade, as well as economic, investment, and cultural-humanitarian cooperation. They also exchanged opinions on various issues on the international agenda. On June 10, 2015, Putin and Renzi took part in opening the National Day of the Russian Federation during the EXPO 2015 universal exposition in Milan. At the event, Putin also held talks with Italian President Sergio Mattarella. Later that same year on November 16, Putin and Renzi crossed paths once again on the sidelines of the G20 summit in Antalya, Turkey. On June 17, 2016, the two leaders met again on the sidelines of the St. Petersburg International Economic Forum, after which a package of documents was signed. Looking at the diplomatic front, the Russian and Italian foreign ministries hold active talks on a wide range of bilateral and multilateral issues. On March 25, 2016, then Italian Foreign Minister Paolo Gentiloni visited Moscow and held talks with his Russian counterpart Sergey Lavrov. Half a year later on September 21, the two foreign ministers had a conversation on the sidelines of the UN General Assembly session in New York. On December 1-2, 2016, Lavrov paid a working visit to Italy and was received by Mattarella. He also held parallel talks with Gentiloni. On February 17, 2017, Lavrov met with incumbent Italian Foreign Minister Angelino Alfano on the sidelines of the G20 Foreign Ministers’ meeting in Bonn, Germany. The two ministers met once again just two months later on March 27, during which time they held bilateral talks. The countries’ ministries and departments continue to maintain bilateral contact. To that regard, the Large Italian-Russian Inter-Parliamentary Commission, established in 2000, held its 14th regular session on September 30, 2015, in Moscow. With regard to bilateral economic and trade relations, Italy ranks among Russia’s largest European trade and economic partners. In 2015, Italy placed fourth in Russia’s foreign trade turnover but slid down to sixth place in 2016. In the past few years, bilateral trade turnover has decreased considerably as a result of the European Union’s anti-Russia sanctions and Moscow’s countermeasures. According to analysts, the Italian economy loses 3.5 billion euros ($3.87 billion) annually in exports to Russia. The Russian Federal Customs Service estimated the 2016 bilateral foreign trade turnover at $19.7 billion, including Russian exports and imports worth $11.9 billion and $7.8 billion, respectively. In 2016, Russia primary exports from Italy included the following goods: minerals (83.2 percent of the total), metals and metal products (6.6 percent), precious metals and stones (3.7 percent), chemicals (1.4 percent), timber and pulp-and-paper industry goods (1.4 percent). Russian imports from Italy included the following: machinery, equipment and vehicles (42.6 percent of the total), chemicals (22.1 percent), foods and agricultural feedstock (9.7 percent), textiles and footwear (9.4 percent), metals and metal products (6.5 percent), timber and pulp-and-paper industry goods (1.8 percent). The Russian-Italian Council for Economic, Industrial and Currency-Financial Cooperation focuses on the main issues of bilateral trade and economic cooperation. Council members held their 14th regular meeting in October 2016. As of 2015, Italian investors had channeled over $1.1 billion into the Russian economy, with Russian investors contributing over $2.3 billion to the Italian economy. Bilateral economic cooperation primarily revolves around energy projects. Italy is the second-largest Western European buyer of Russian gas after Germany. It receives Russian gas under long-term contract via trunk pipelines. Italian energy giant Enel is involved in power industry projects and owns a controlling stake in Russian power generating company OGK-5, which was renamed to Enel Russia in September 2014. The company includes the Konakovskaya, Nevinnomysskaya, Sredneuralskaya and Reftinskaya state power plants. Rosneft and LUKoil own stakes in Italian refineries. Both countries also cooperate in the aviation industry. Russian aircraft manufacturer Sukhoi Company and Italy’s Alenia Aermacchi jointly sell the Superjet-100 airliner on global markets. The Heli-Vert Russian-Italian joint venture manufactures AgustaWestland medium-sized two-engine civilian helicopters. In 2011, Russian Helicopters and AgustaWestland, two leading helicopter manufacturers, signed an agreement to establish this venture on a parity basis. Russia and Italy have been expanding science cooperation, primarily in nuclear research, bio-engineering, nanotechnologies and space exploration. Bilateral cultural-humanitarian ties hinge on the 1998 inter-governmental agreement on cultural and education cooperation. 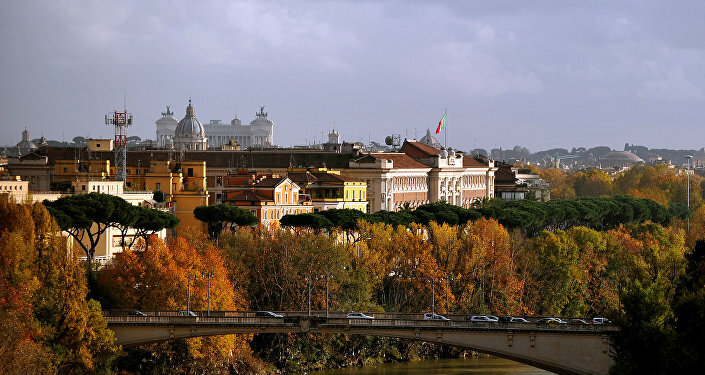 The sides implement a number of projects to promote the Russian language in Italy and the Italian language in Russia. In 2009, both countries signed an inter-governmental agreement on the mutual recognition of education certificates issued in both Russia and Italy. Youth interaction also continues to develop, as evidenced by the national culture weeks which have been hosted by Russian and Italian secondary schools since 2004, as well as by the number of exchange students each country receives. Tourist cooperation has also seen an upward trend. According to the Russian Federal Statistics Service, over 700,000 Russian tourists visited Italy in 2016, while over 192,000 Italian tourists came to Russia in that same year.